Learn the vocabulary of bookbinding, the basic tools and their uses in the binding of books, as well as common materials used (paper, cloth, board, and adhesives) and foundational techniques (folding, sewing, and gluing) of the craft. Workshop participants will construct four hardcover, hand-bound, multisection books over the course of the series. Each binding in the series will add to the skills previously learned and integrate new techniques. Modifications for working at home without complex equipment will also be covered. Topics and hands-on techniques covered over the multi-week course will be: the process of selecting and curating the narrative of the album, technical help if needed for printing your images through their digital department, preparing images for placement (sealants and archival placement methods), creating custom binding, hand sewing techniques and variations, and the vocabulary, tools and techniques for building albums on your own. Learn the basics of creating your own handmade paper with exotic fibers from your garden, grocery and local florist. From the harvesting and collecting stage to finished sheets, you will learn the process for making paper with unique fibers (such as grasses, vegetables, fresh herbs and flowers). Students will get a chance to learn the keys to cook, beat, and form sheets of paper in this one day intensive. Most sheets will be air-dried; some sheets will be left to dry under pressure for several days and mailed to students. Materials to bring: None. There is a short tool list which will be emailed for the class once you are enrolled. Fibers for use in this class will be provided; local resources will be given for future reference. Knowing how to make books is essential in the checklist of life. This one day course will teach you all the basics: vocabulary, tools, folding, gluing and stitching basics and students get to make five different basic books in the process. The materials and skills students gain from this course is the stepping stone to many other bookmaking adventures, and not to be missed. Are you longing to take your bookbinding to the next level? Take this one day, beginner’s level class on the exquisite longstitch! Not only will you learn the ins and outs of this traditional German, non-adhesive, stitch pattern binding, but you’ll also learn to laminate decorative papers to create sturdy and malleable book covers. The Coptic binding is an ancient non-adhesive binding that is sewn using multiple needles and has modern appeal. Its exposed sewing is complemented by the variety of materials that can be used to make book covers. In this daylong workshop, you will fold, punch, and sew a Coptic binding with covers made of decorated binders board. Some bookbinding experience is helpful, but not necessary. Making boxes can be a complex and mind boggling experience. This class will teach building techniques, materials suggestions and tips and tricks for making basic boxes successfully at home. Having a guestbook for special events is a wonderful way to capture memories, and this workshop will teach you how to make several styles of guestbooks. This simple and yet elegant hardcover single section sewn book dresses up and customizes any range of events; weddings, baby showers, art exhibitions, funerals, work functions, anniversarie parties, major birthdays or engagement parties. In the Japanese Stab Binding workshop participants will build a hinged hardcover Japanese-bound book and then build an enclosure to house it. The first portion of the workshop will cover creating a Japanese-style text block and binding of the hinged hardcover book in Japanese silk book cloths and papers. The second portion of the class will be devoted to learning how to create a Japanese-style box with bone enclo- sures. Instruction will be given on how to apply this technique to students’ own objects and books for future box-making endeavors. There is nothing quite like the satisfaction of journaling & sketching in a book you have made. This class is designed for the beginner, and welcomes artists of all kinds to create a book for a thousand uses. Made of a soft leather with a beautiful stitched pattern on the spine called the longstitch, this rugged book is meant to be trekked & traveled with. This workshop will take place at 1890 Bryant Street Studios. Learn the basics of creating your own handmade paper with exotic fibers from your garden, grocery and local florist. From the harvesting and collecting stage to finished sheets, you will learn the process for making paper with unique fibers (such as grasses, vegetables, fresh herbs and flowers). Students will get a chance to learn the keys to cook, beat, and form sheets of paper in this one day intensive. Using the skills covered in Bookbinding I, you'll learn a modified form of a lapped-component case binding, also known as a Bradel binding. You'll have more control over the design of your book than you did in Bookbinding I, with greater use of bindery equipment such as the board shear and guillotine. You'll sew, round, and back two books. You'll also learn to make quarter- and half-case bindings with a cloth spine piece and/or corners with paper sides. This beginning-level workshop is designed to familiarize the uninitiated with the world of letterpress by offering hands-on experience with the Vandercook cylinder press and the tabletop platen press. Participants will learn the difference between the types of presses as well as the basics of setting type using SFCB’s vast collection of lead type and decorative ornaments. This introductory workshop teaches basic structures and stitches that every book artist should know in order to create a multitude of books. Learn a variety of structures—single-sheet book, accordion book, single-section pamphlet stitch, combined concertina, and Japanese stab—and make fun. Being able to make book cloth immensely expands the range of possibilities for bookbinding, opening up a whole new set of choices for cloth color, texture, and weight. Just about any ordinary natural fiber cloth can be made into excellent book cloth. In this workshop, students will learn how to make book cloth in two different ways from start to finish, and leave with many finished samples. The Learn to Make Book Cloth workshop will give students greater creative freedom over the look and feel of covers for books, boxes, and portfolios. Create two different softcover wraparound books with two lines of caterpillar stitches running around the cover to hold in the text block. This binding focuses attention on the beauty of the caterpillar wrap stitch and caterpillar braid stitch. Unlike most caterpillar bindings the signatures in this structure are bound with the stitch through the cover on the spine. Using handmade paper for this binding gives a natural look to the book and draws attention to the uniqueness of the paper. Students will also see samples of artists” books created using this binding style. Prerequisite: some bookbinding experience. 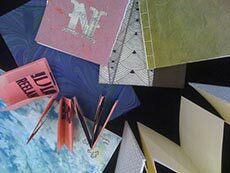 This class will be an exploration in ways to brainstorm and "play" your way into artist books. By freeing up your working process, new ideas and methods can come alive. We will briefly investigate the meaning of symbols and markmaking throughout history and work from free form gestures to hardbound books. Students will create two finished artist books during the class. There are five basic structures and stitches every book artist should know: Accordian book, single section pamphlet stitch, vertical link pamphlet, flag book, and Japanese stab. We will learn fun and simple ways to make these structures and creative uses for turning them into artist”s books. Make one complex book in two days. We'll make a true Bradel binding (lapped-component case binding) with split boards. We'll round and hammer back using wheat starch paste, and we'll sew silk endbands, a class favorite. We'll include double-folio colored endsheets and a half-cloth binding with decorated paper sides. Learn to make a modern artist portfolio with unique colored plexi-glass covers and luxurious papers. This book is bound using a coptic link stitch which allows the book to lay flat for viewing and has a very professional and modern look with custom made plexi colored covers. Design ideas and layouts will be discussed as well as tips for digitally printing your portfolio before binding.